Mass of Glory and Praise equips parishes and schools with a core repertoire of prayerful, memorable, contemporary settings of those songs of the Mass that are most frequently sung - the Kyrie (Penitential Act), Gloria(Glory to God), the Alleluia (Gospel Acclamation) and Lenten Gospel Acclamation, the Sanctus (Holy, Holy, Holy), the three new Memorial Acclamations, the Amen, the Pater Noster (Our Father), and the Agnus Dei (Lamb of God). 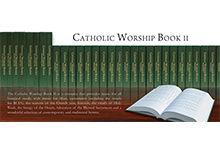 This 2nd edition of Mass of Glory and Praise has been recommended by the Australian Bishops for use in all parishes and schools throughout Australia, to help develop a common Australian repertoire for the Mass. You can purchase Mass of Gory and Praise products here.